A home should tell a love story…. So many people think that an interior designer’s job is to just “make things pretty”. And while the end result IS very pretty, there is so much that goes into the overall project. The interior design fee includes not just the time it takes, but the intellectual property and design genius a good design firm brings to the table. But our job goes way beyond that. A good interior designer learns all about their client’s wants, needs, and how they live. The designer has the vision for the space, tailors it to the clients’ needs – and then plans and implements that vision so that the room(s) are both functional AND beautiful. It’s not unlike a pair of shoes – they may LOOK good, but if they are not comfortable, you won’t enjoy them. A designer will balance the client’s aesthetic style with their lifestyle – while also working with the home’s architectural features (including where to hide the electrical outlets or cords). Keep in mind, that while juggling these details a good designer works closely with a handful of trusted artisans, vendors, and contractors who fulfill the design. Budget analysis & adjustment – because most clients do not have a money tree growing in the backyard, we advise on what sort of financial investment is realistic and adjust accordingly. The interior design fee is not allocated towards the purchases or renovation costs. This is where our team runs through all of the “big picture” ideas and hones in on the final vision. This includes creating custom solutions the layout of the furniture, general color palette, unique features, furniture pieces, and how the room(s) will flow. We operate as a team and joke that you “buy one, get three free” because we collaborate and share so many ideas. We all have unique perspectives and experiences, and that combination benefits our clients. Once we have the general vision, it’s time to make sure that vision is viable. We meet with contractors on the project site to discuss the details so they can start pulling together a bid. This is necessary whether it is a full remodel or simply having the drapery workroom measure the windows accurately. Have you ever “eyeballed” a piece of furniture at the store, purchased it, and found it was the wrong size when you got it home? Yah. Me neither. haha. So instead, we ensure all rooms are measured accurately so we can select and deliver the right size furnishings the first time. Avoiding this headache alone, not to mention restocking fees – is worth the design fee alone. You can rest assured your furniture will be the appropriate size. Once we have the basic color palette selected, we begin ordering fabrics, rug samples, tile and such – where needed. It is not unheard of to order up to 500 fabric samples to edit down to 25 – 50 for a full house design. Yah, you read that correctly: 500 fabrics samples. It’s not a good day to wear black clothing, because the amount of lint is ridiculous! A fancy term for shopping. This is much more detailed than you can imagine. We have to confirm the dimensions, color, finish, availability, pricing and shipping terms for every single piece. And if we are creating a custom anything, we have to make sure the item is fully specified for the artisan to create. For example, a custom pillow should be simple, right? Well, we have to confirm the fabric selection not only works with the design, but will withstand the use, determine what size pillow is necessary, confirm whether we want the pillow form to be a polyester fill, down filled, or a blend, and of course we must choose a trim for the pillow (self corded, knife edge, or a decorative trim) and whether it should close with a zipper or a button fold. You cannot imagine the number of phone calls and emails between us and the vendors…and if one thing changes (i.e. is discontinued or not available in the finish we want), it can change the whole room’s selections / color palette or even the design. These images will help us confirm or revise our initial design details. This feature also helps the client visualize the concept we have planned for them. Want to see more of this project? See some before and after HERE and check it out in our PORTFOLIO. In addition to the renderings & elevations, when a remodel is involved, we provide the full construction documents, including the electrical plan in the design fee. But we will leave those details for another blog post. We collect as many samples of the selections we will be suggesting to our client so they can touch and feel the items in our studio before giving approval to purchase. 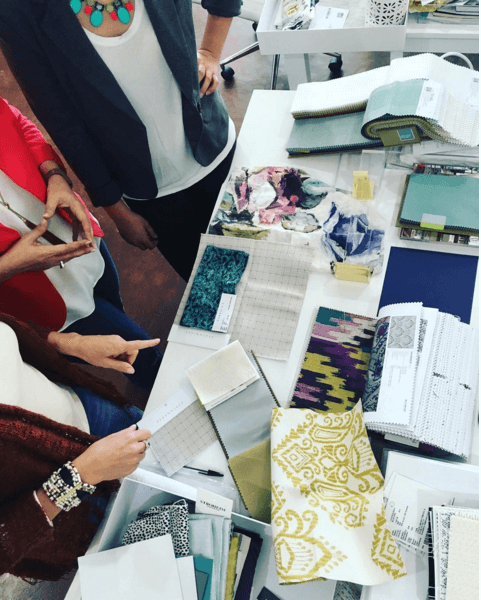 Samples include fabric, trim, paint colors, wood stains, area rugs, hardware, stone and tile, linens, wallpaper, furniture samples (as available) and anything else that is applicable to the design that we can get our hands on to convey our vision. Again, a ton of phone calls and emails to coordinate any items that the vendor lends us temporarily. This presentation is usually delivered in our design studio and will last 1 – 4 hours, depending on the size of the project. This presentation includes EV.ER.Y.THING regarding the design. It’s so much fun! It also includes food – and if it’s Happy Hour, we serve cocktails. This is a great time for our clients because we are unveiling what has been developing for months and answers all of the design challenges they brought to us to solve. Yah, but what does all of this cost? There is no industry standard. Interior design fees have a wide variety of structures. Some designers charge an hourly rate ($75 – $500). Some designers work based on a flat fee, which will vary depending on the size of the project but can range from a few thousand dollars to a hefty 6-figures. The calculation of the flat fee may be based on hours estimated, square footage, level of detail – or a combination. Most designers will require a deposit or retainer before beginning the design. Some designers don’t give the whole presentation as part of their service, but rather do the shopping for you as a piece by piece solution. This is an industry that can vary widely – but like anything, you get what you pay for. The interior design fee does not just pay for the actual service, but also for the expertise and talent the designer brings to the table. Solving problems, creative ideas, beautiful rooms and the FEELING of happiness each time you enter the room is what you’re paying for. So there you have it in a nutshell. What does the interior design fee include? A LOT, my friend. A LOT. What Does An Interior Design Fee Include?